Roundup is the controversial herbicide weedkiller produced by Monsanto and sold in Ireland and all over the world. And it is in your bread. Here is How, and Why that is not a good idea…. 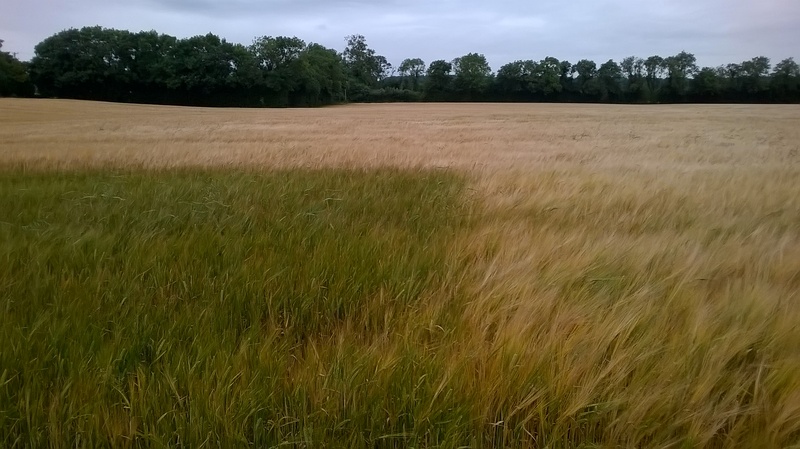 Irish farmers are spraying roundup onto wheat crops. They do this because the Irish climate has a warm, wet summer. (As I write this on July 28, it is raining and temperature is around 15C). 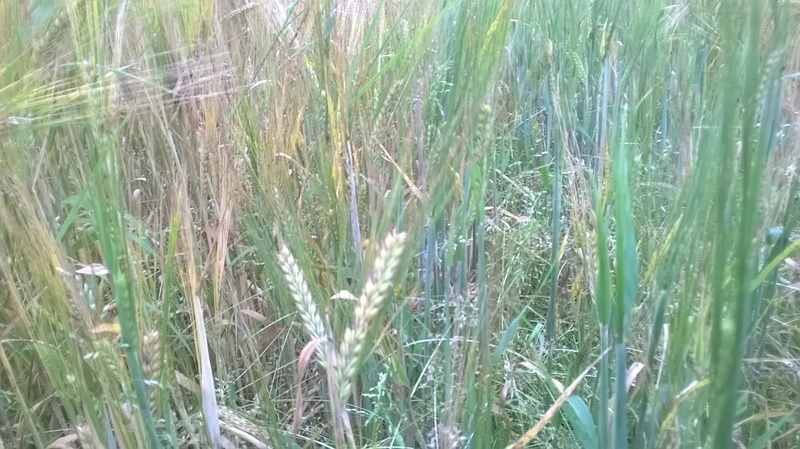 However, wheat needs a hot dry summer… Think Italy, or any similar Mediterranean or Continental summer. 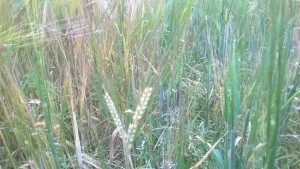 In a hot dry summer, the wheat plant naturally stops growing, and the seeds dry out, ready for harvest. The above photo, taken in July 2016 in Co. Kildare. Look at the grey sky. It has been overcast and wet often this summer. Yet the field is full of golden dry wheat. Look at the tracks of the tractor. Why was the tractor driving through the crop? To spray it. Why are the tracks green? 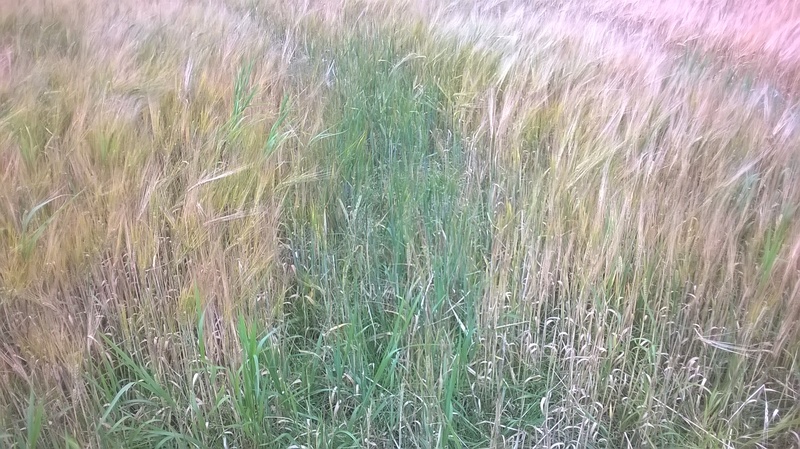 Spray didn’t reach there.. You will also find green wheat at the edge of these fields, where the spray did not reach. 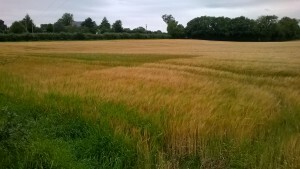 In a wet Irish summer, the wheat plant keeps growing, and the seeds don’t dry out. They may even start to sprout “on the stalk”. In other words, wheat is not really an ideal crop for Ireland. Indeed, our ancestors ate a lot of oats and barley as a result. In any case, the “modern” solution is …. Roundup. Roundup is sprayed directly onto the mature wheat crop. This is done to “ripen” it. This is another way of saying “kill” it. By spraying the wheat that will become your bread with roundup, the plant dies, and transpiration stops. 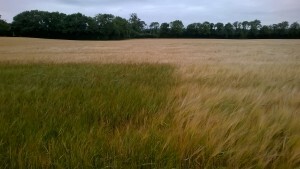 So the wheat seeds dry out, even in a wet Irish summer. How great is that? Not very great at all, actually. Monsanto says Roundup is biodegradable and safe, but they were forced by a French court to retract that statement, it no longer appears on their packaging as it did before. Monsanto did tests on rats that “showed” no adverse affects of eating food sprayed with roundup. However, a French scientist repeated the experiment, but made it last longer, for more “rat years”. The result was horrific tumors on the bodies of the roundup eating rats as compared to the control group. A number of European states have voted to withdraw the licence for roundup, which should result in its being banned in Europe. However, our European masters in Brussels have over-ruled the member states and allowed sales of roundup to continue. In fact Roundup has been banned in Holland, and France. But then at the same time the German government comes out on the side of Monsanto. (Monsanto have deep pockets for lobbying). Despite that, in April 2016, the European Parliament voted to severely restrict the use of Roundup. However, they have been over-ruled by the unelected EU Commission. (And now you know why Brexit might be a good idea after all!). The Big Question: Does it get into your bread? Unfortunately, Yes. A study was performed by the Pesticide Action Network in the UK. They reviewed tests carried out on bread over a period from 2000 to 2013. Year by year, up to 75% of non organic bread was found to be contaminated by pesticide residues… and the most common pesticide residue found was …. Roundup. In contrast, apart from one year, the study found Organic bread to be free from pesticide contamination. 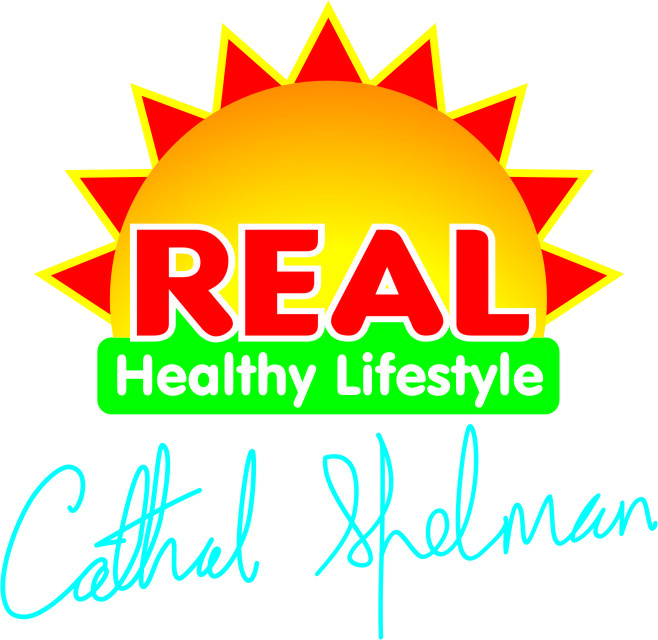 Another study found that non organic wholewheat flour and bread contain highest levels of roundup in wheat products. The same study showed non organic lentils, beans and chickpeas to contain high levels of roundup residue. In all cases the probable cause of contamination was use of roundup as a “dessicant”. (That is another way of stating the use for “ripening” or drying out the crop, as I mentioned above). So, you like bread… And indeed, bread is not a major problem food, as long as it is eaten without adding oils, butter or fatty food. (Although, it usually is eaten like that, and thus becomes a delivery system to unhealthy fatty food). But the question is, what can you do if you wish to eat bread? Eat Organic Bread. It can be found. Make Organic Bread. Organic flour is easily got in Health food stores. Bread is easy to make. I recommend you get a food processor that has a kneading attachment, as kneading bread is a pain. Avoid non-organic wholewheat products. Yes, it should be healthier. But the skin of the wheat seed gets the most spray, so wholewheat bread is found to contain more roundup. Ask your public representatives: Why are you allowing my family to be fed bread made with wheat sprayed with roundup? Ask your supermarket to stock organic bread and organic flour, and organic pulses. And tell them why you want it. Post in the comments below where you find organic wheat products, so we can reward those shops who make the effort. In case you are at all skeptical that Irish farmers are indeed treating us to Roundup Sandwiches, below is further evidence. These photos taken on 12 August 2016 in Co. Kildare. Above: Overview of the field. Notice the green wheel tracks where the spray did not reach. Also there is a green square…. Roundup must have run out in that portion. Closeup of a wheel track. Wheat is crushed down by wheels and escapes the roundup spray, leaving it to come up later still green. 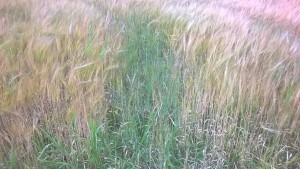 Above, Close up of sprayed vs unsprayed wheat, green and alive, vs brown and dead. 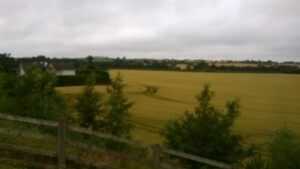 Above, the green square of wheat where the spray must have run out. UPDATE: The Irish Department of Agriculture has an annual pesticide in food publication. The latest I can find is 2012. 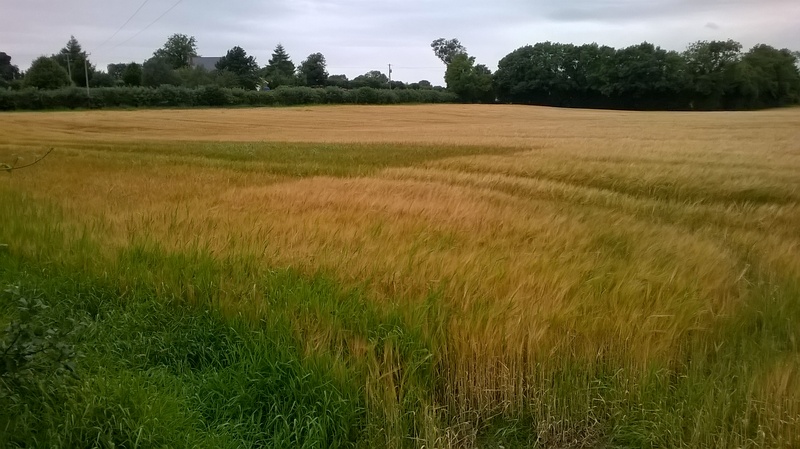 Irish wheat was tested, and the highest level of Glyphosate (roundup) detected by 0.57milligrams per kilo. The Maximum Residue Level allowable is 10 milligrams per kilo. While the level detected is only 6% of the maximum allowable, it is worth to bear in mind that allowable levels are quite arbitrary and subject to change. It is also worth noting that 0.57 milligrams per kilo is similar to the typical amounts of some vitamins, which is enough for the vitamin to have a definite and beneficial effect. However, Glyphosate is NOT a vitamin.